About 10 to 15% of adults experience tinnitus, which is the perception of ringing or other phantom sounds in the brain. Of those who experience chronic tinnitus, 20% report that the symptom causes clinically significant distress. Because there is evidence that alterations in the function of the brain, specifically the auditory cortex, may be responsible, in part, for this experience, TMS has been tried by a number of investigators as a potential treatment with some promising early results. However the studies have all been flawed by the lack of a very good “placebo” control for active TMS treatment. A study just published on the internet in JAMA Otolaryngology, Head & Neck Surgery (and not yet available with the full reference) addresses this issue with a state-of-the-art placebo control, shows that active treatment is significantly more effective than placebo treatment. 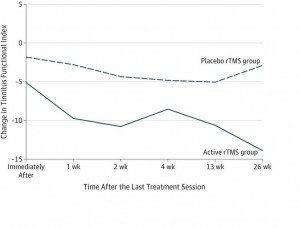 Participants received 2000 pulses per session of active or placebo TMS at a rate of 1-Hz over the auditory cortex, and they had TMS sessions daily on 10 consecutive workdays. 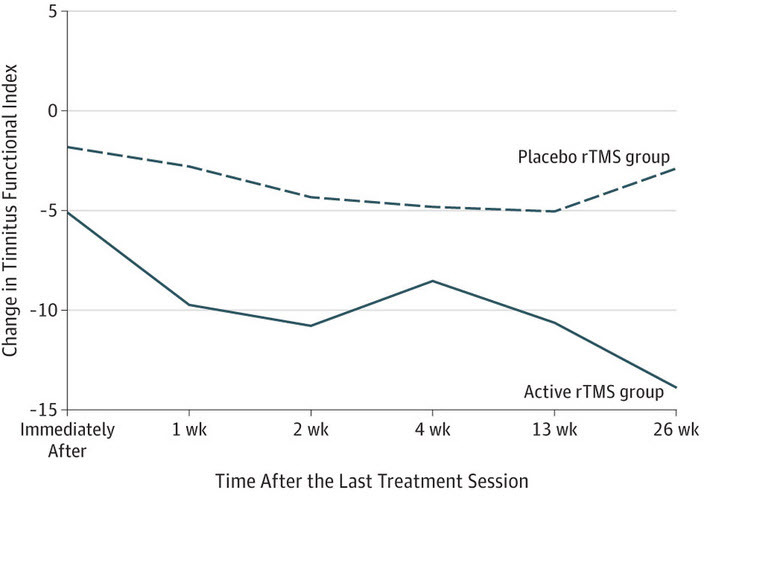 In this study 56% of people with active TMS experienced a clinically significant improvement versus only about 20% of those with placebo TMS. The study illustrates that TMS is likely to be effective for many more conditions than just depression. As with the treatment of depression, the effects from TMS on tinnitus persisted through at least 26 weeks of monitoring.